Lately, when I am on my home wifi I’ve been randomly receiving the message “Err_Network_Changed” from within Chrome. As you can see from the screenshot, when this displays there is no page content. Sometimes was able to refresh the page with the F5 key and it cleared. Sometimes I was able to solve by using a different browser. I searched and found that many others are having this issue also. 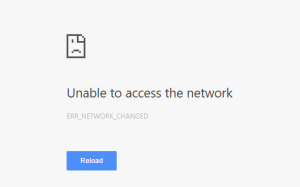 There are a variety of solutions posted including: disabling all extensions in Chrome, clearing DNS cache, resetting the wifi adapter, and rebooting the router. I tried them all. Sometimes it worked immediately and sometimes it did not. In all cases the problem would reappear. What I could determine was the problem seemed to be with my main wifi router. When I would connect to the extender the issue would go away. This told me that there wasn’t an issue within the computer OS or browser. Also, rebooting the main router would help for a short time. I logged into the router as admin looking for any clues and then I noticed the channel setting. Then I remembered that changing the wifi channel could help to reduce interference with other signals. I downloaded a free app from the Google Play Store called Wifi Analyzer. This showed me what signals were present and which channels they were using. It also showed recommended channels to use. Using the admin interface on the router I updated the channel to the recommended setting and have not received the Err_Network_Changed message since.